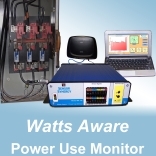 Watts Aware WA-118 products are complete, turn-key systems for monitoring and tracking power usage. Based on non-interrupting measurements of AC current, a WA-118 can be configured and installed for remote, real-time power monitoring in under an hour. These products are ideal for monitoring large individual equipment or groups of equipment powered from a single power distribution panel. 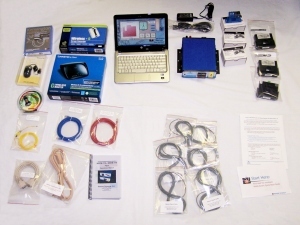 Items included in package for WA-118d. Click for detailed list (.pdf). Components used in Compressed Air Energy Savings Program. Click here to learn more. * Other high-current sensors - with various dimensions suitable for Bus Bars or large diameter cables and capacities up to 5,000 Amps - are available upon request. Sensor Synergy has teamed with CTRL Systems to assemble a complete compressed air energy saving solution that performs several key measurements to keep your compressed air system working efficiently. These measurements track and record air compressor electrical power usage, air pressure fluctuations and the aggregate air leakage in cubic feet per minute (cfm) in your facilities compressed air system. 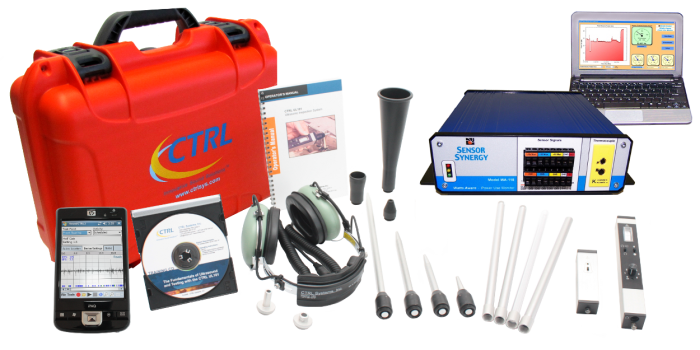 This solution also provides ultrasonic leak detection tools so that you can locate, assess and tag costly compressed air leaks in your facility's air pipes, air drops, and connectors. Let Sensor Synergy's staff of industrial energy efficiency experts help you identify energy savings opportunities by analyzing power-use data associated with the operations of your larger, power-hungry machines. We can help any or all steps in the energy saving process: conduct power measurements, analyze the data, correlate data features with manufacturing activities, calculate costs of operations, assess energy saving alternatives, and help you plan a maximum impact energy-use reduction strategy based on your production activities, equipment requirements, and ROI needs. Our staff has many years of in-the-field, industrial experience backed by substantial engineering credentials including PhD, MS and BS degrees in Electrical Engineering and related fields from top-20 US universities. And our staff will collaborate with you and your staff on these tasks as much as desired. Due to the widely varying work environments our consultants encounter during the measurement phase of our work, we have found consulting packages based on project work hours provide our customers with the most benefit for each situation. More involved energy consultation products can be arranged to fit your needs!